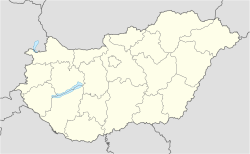 Söjtör is a village of approximately 1500 people located in Zala County, in western Hungary. It was the birthplace of Ferenc Deák, a Hungarian statesman living in the 19th century who served as the Minister of Justice during the Hungarian Revolution of 1848, and is now known as "The Sage of the Country". ^ Söjtör at the Hungarian Central Statistical Office (Hungarian). ^ Bain, Robert Nisbet (1911). "Deák, Francis" . In Chisholm, Hugh (ed.). Encyclopædia Britannica. 7 (11th ed.). Cambridge University Press. p. 894. This page was last edited on 12 March 2019, at 18:12 (UTC).